The Corinthian features a sunken gourmet galley with stainless steel appliances including and a state-of-the art entertainment system with surround sound and tracking satellite for TV. 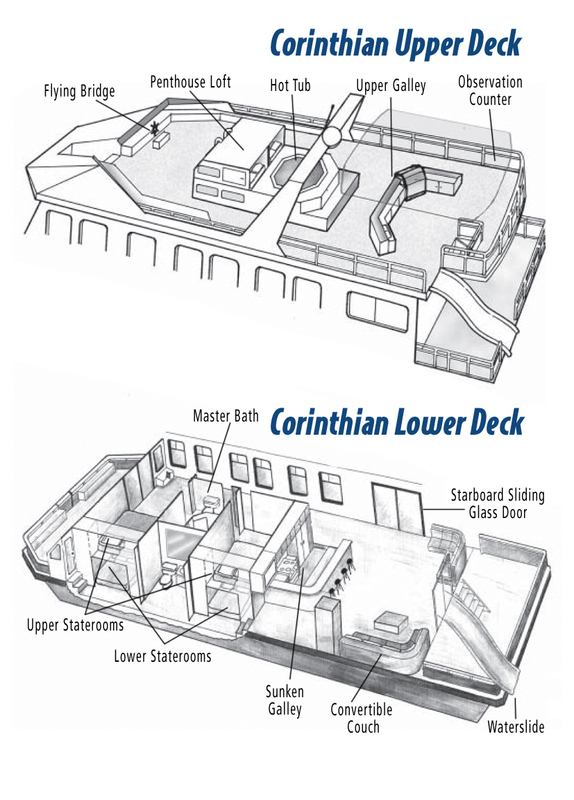 The upper deck incorporates a hot tub, air-conditioned loft and second galley with barbecue and fridge. This stately vessel has four private staterooms, each with private access to a bathroom, and a convertible couch in the main salon. A sliding glass door on the starboard side of the main salon creates ease of passage between houseboat and ski boat. The Corinthian sleeps 12 comfortably (14 max).